The club are currently bottom of the table and have won just two Premier League games all season. EMBATTLED RANDY LERNER has stepped down as Aston Villa chairman with Steven Hollis taking his place in the role, the club have announced. 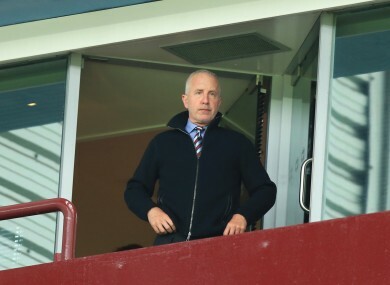 Lerner had been under pressure from fans after he oversaw a number of unsuccessful seasons and managerial changes, with the esteemed club regularly hovering in and around the relegation zone during that time. “That Aston Villa can and should operate in a far more stable and on a far more successful level, both in terms of football as well as commercially, is plainly clear. It is similarly clear that this great club has not been on stable footing for at least five years. “In May of 2015 I again reiterated my intention to sell the Club or, in the alternative, to shift to a Board governance structure that begins with the appointment of a new Chairman; a Chairman with a proven track record for getting into the thick of troubled organisations, working with embattled executives and getting results. Steve has taken the last six weeks to become familiar with the deeply serious predicament in which the Club has found itself and has my total support to address the issues we face. We pursued Steve’s candidacy in order to continue and strengthen the efforts that commenced in the summer of 2014 with the hiring of Tom Fox. Tom and Steve have spent time throughout December and early January and will therefore be in a position to work closely and immediately across all areas of the Club. “We anticipate that Steve will give us additional reach within local business circles as well among government and quasi-government organisations. Steve has consistently demonstrated his commitment to Birmingham not only in his private commercial roles but also recently as deputy chair of the LEP and chair of the Birmingham Met. “Regarding my future role with Villa, I expect to remain engaged with both Steve and Tom although at a somewhat further distance that I believe suits the reality that I live full time in the States, and that is appropriate given Steve’s need to have the room to make decisions on behalf of the Board. I feel that as the business of football grows alongside the growth of the sport globally with the English League at the forefront, having a Chairman that has earned an established business presence in the region in which the club plays creates an important strategic advantage that we have to date lacked sorely. Email “Under-fire Randy Lerner steps down as Aston Villa chairman”. Feedback on “Under-fire Randy Lerner steps down as Aston Villa chairman”.